Whew! Two posts in a few days. Being able to get several pieces photographed over the weekend, gave me a surplus of material to put up here for you! 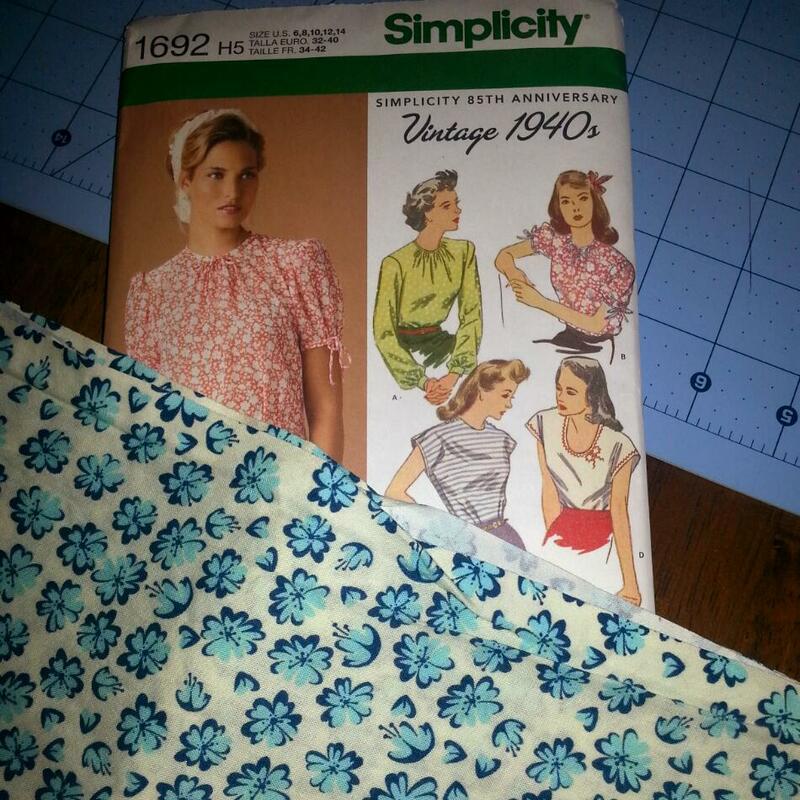 I recently completed a second version of #Simplicity1692. You can see my first one here. This time I’m sewing View D, without the little ric-rac bow… I’m still thinking about going back and adding that, but I’m on the fence. What do you think? To Bow or Not To Bow? The construction was super straight-forward. 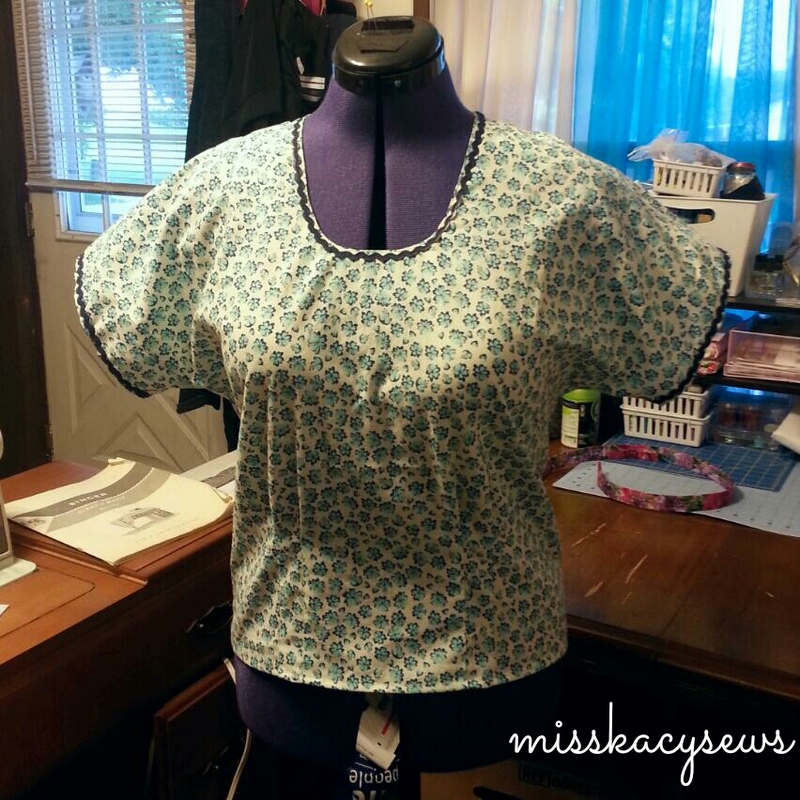 The sleeves are cut in, so no setting them into the shirt. 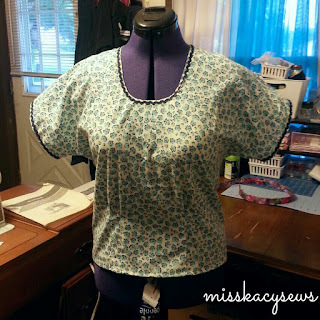 You literally just sew in the darts/tucks, front and back, put in the facing for the neckline and buttons on the shoulders and then sew front to back and turn and hem the sleeves and bottom. I love the button detail on the shoulders and I wish I had gotten a better picture of that part. I honestly didn’t even think about it when I was taking photos. (That’s what happens when you’re trying to get as much done as possible during the baby’s nap.) It is a really cute feature of the blouse. I paired this with a navy pair of high-waist shorts. I believe they are Voodoo Vixen brand. All in all this blouse is very comfortable and easy to wear. Because I made it of cotton, it’s pretty cool and breezy on these hot summer days. This blouse has a great fit. Especially through the back and shoulders, which is a recently discovered problem area for me. I’ll be posting more about that in the near future. I really have no complaints about this top. As I said before, construction was a breeze and it went together very quickly. The fit is great, and flattering thanks to the front and back darts/tucks. This project cost less than $5 to complete. 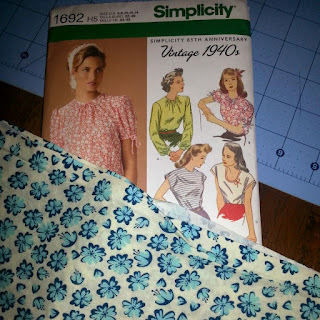 The pattern I bought on sale in a 5 for $5 Simplicity sale at Joann’s and the fabric is from their Quilter’s Showcase and it runs $4.49 a yard not on sale. I’m pretty sure I got this on sale. If not I used a 50% off coupon, so either way, I didn’t pay more that $2.50/yd and I bought two yards. The buttons and ric-rac were in my stash, so they didn’t cost anything to use. This was #vintagepledge number 7 for me.